Spotted in Sochi, the return of the famous beer fridge only accessible to Canadians. In the spirit of the Winter Olympics, Molson has sent one of their beer fridges to Russia for the games. Canadian visitors will be pleased to find their exclusive homeland brew of Molson free of charge after a quick test of national belonging. Molson's only requirement is that you are a citizen of the great frozen land up up North. 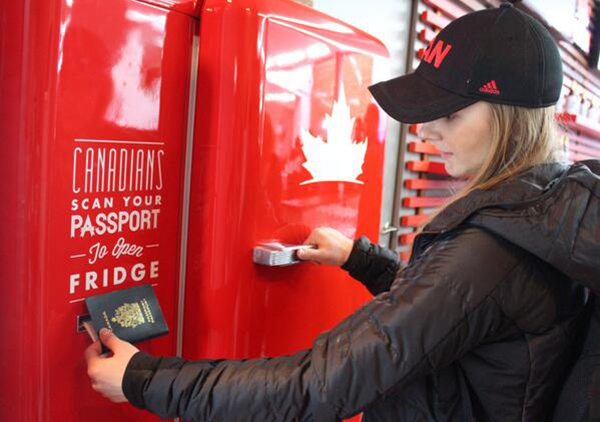 To unlock the fridge, a Canadian passport must be scanned before beer is available. Once proven Canadian, the door will click open and cold beer is made readily available. Check out this video below and see Europeans try to get access to beer they can't have. Sochi sees you, Molson.